DrGabe's Miniatures: I love banners... on my sergeants. 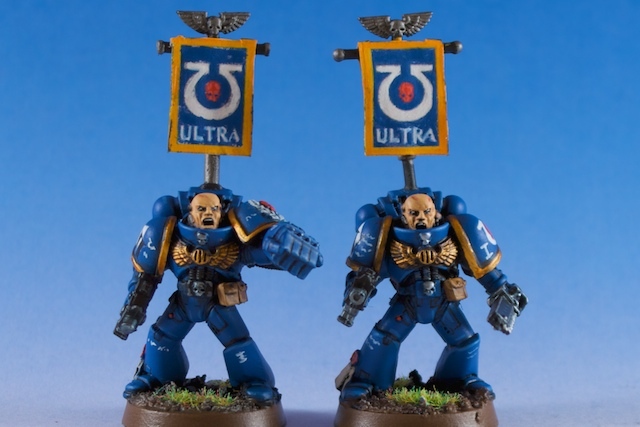 I've talked about this before, but one the things I love about squad leaders and characters in the 40K universe is that they have giant banners on their back. A friend of mine who is quite the military historian says that this is crazy and guarantees that he will be targeted by enemy fire. Apparently, in the 40th millennium you want the big bad crazies coming straight to your space marine leader. With Adepticon looming near, I have taken two of my Sergeants and converted some banners to their backs. In the future, all sergeants will be getting a banner. For these models, I scanned a copy of 'Insignium Astartes' and copied the image of the sergeant into photoshop and resized the image to fit on a standard banner. From there, I painted over the image with my standard colors to give it a bit more "hand drawn" feel to it. The final results are good for my table quality Space Marines.